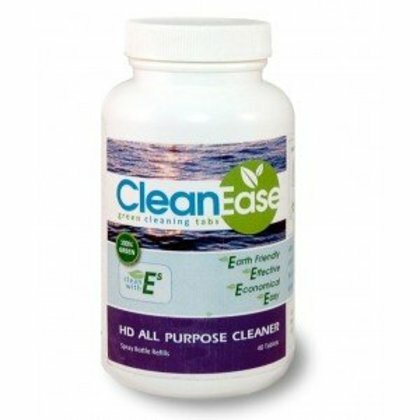 Clean Ease All-Purpose Cleaner: 40 Tablets Make 40 Bottles of Eco-Friendly All-Purpose Cleaner! Revolutionary Green Cleaning Solution: 40 tablets = 40 bottles (quarts) of all-purpose cleaner. Simply drop a tablet into a spray bottle and fill with water. Clean Ease products reduce waste by allowing you to reuse the same spray bottle multiple times. The compact packaging reduces your carbon footprint by saving on fuel and lowers shipping costs. We pass on the savings to you: make 40 bottles of eco-friendly all-purpose cleaner for less than $1 a bottle! Did you know? Cleaning products contain mostly water. Why waste plastic, energy, and money, when you could use water from your own home along with a Clean Ease tablet to make a bottle of eco-friendly cleaner? Clean Ease All-Purpose Cleaner is effective, non-toxic, and safe for use anywhere in your home. For use on tables, counters, stoves, walls, floors, tile, etc... Lifts grease and grime off of a variety of hard surfaces.